Hi just looking for a quick comparison on these two skis and how they stack up against each other. I'm 6'2", 235 lb. just starting to cut the rope 36 mph skier do spend time at 32-34 mph when working on new line lengths. Both are very good skies. I've been on both for extended periods, but at 34mph only. The CoX/sl has a light feel and easy to ride. Very little skier effort if any needed to get it to go. That's where the step bottom comes into play. Gets very wide all on it's own. Boot placement is critical. I did not like stock fin settings. Ski can overturn at apex or finish of turn if pushed. But it can generate/establish more angle after the trun if you pushed at that point as well. Horton wrote a review on it and I agree. Vice is a Strada for the most part. Liked that ski as well. Huge difference between Strada and Vice??? No, not that I could tell. I'm sure there is but skied them weeks apart. Difference between it and the CoX would be a pinch more effort needed and whatever angle you get out of the turn is what you will take across course. Did not overturn. Very very stable ski. I would recommend both to be honest. I rode both into deap 38s. Both are skies that will take any skier into shortline. I think for either, you get a ton of ski for the price. More so than a $1200 ski. I've seen deals on the 2011 Vice new for $400 and the CoXsl I demoed was under $350 for the demo ski itself. They are different enough in design and feel that I would try before I bought one. One may fit your style better than the other. The CoXsl fit mine better but that's just me. I just returned the CoXsl today and if I get time I'll write a comparison to the S2 which I roads the week before. Thanks I think that helps a lot. I can get my hands on either of them new for $500 bucks each and I have performance guarantee so if I don't like one I can trade it for the other one. Essentially a demo program. That is Canadian pricing too. I like to do my best to support my local dealer even thought it's costing me an extra $100 bucks. How is the dampness of the 2 skis. The co X/sl is almost 100% carbon fiber compared to the 50/50 of the vice. Notice anything significant when skiing in "a little" rougher conditions. Wind blown, etc. I think, believe it or not, the CoX was a better rough water ski. Aside from that, they are different in so many ways in design that other factors outside of layup may be what makes one feel better in rough water than the other. I would like to see your comparison of the two. I rode the COxSL all summer, then picked up an S2 and was able to ride it 2 different days while in Florida over Thanksgiving week. I would also like to know where you put your boots on the COxSL. I like both of these skis, but feel like the S2 is more solid/predictabl/confidence inspiring, not really sure how to describe the difference exactly. 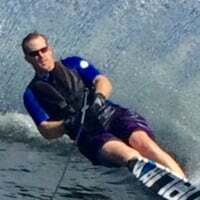 I am a new skier -last summer was my first full summer slalom skiing - I started the fall before at age 45. So I am still trying to master 15 off, love the challenge and really enjoy freeskiing as well. So my comments on how they ride are very uneducated - but I can tell you from the skis I have tried that I definitely formed my favourites early. The COx was the one I liked best till I tried the S2. I never messed with binding placement though and wonder what that will do to how it skis. I guess I just assume a bit that a near 100% or 100% carbon ski will ride a little "rougher" in the "chop" then a 50/50 like the vice but I guess there are also those steps to be considered. Anyway I will try them both out as soon as possible and hop on'em and see how they stack up. So in your opinion running into 38' the Vice is more or less a Strada at a cheaper price. Sorry I am getting of track here a little bit. Really no difference util you are in to 39' or 41'. Side note where did you have your binders on the co x/sl. Thanks for all the help.